Foot, meet Mouth. You guys are perfect for each other. Eventually, my mom couldn’t take me moping around the house any more and got me a job working at a church making Powerpoint presentations and helping the youth minister. It paid well and I loved the people I worked with, so it wasn’t a bad deal. Then one sunny, beautiful day, I went into the sanctuary to get the external hard drive that stored the Powerpoints. 1) The roof started to shake. There were strands of lights hanging around the skylight in the middle of the sanctuary and I could see them swinging around. 2) There was a tremendously loud rumbling noise coming from all directions above my head. 3) There were shadows zig-zagging around the room crazily. Something was sporadically blocking the skylight, moving quickly. 4) The lights on the wall wouldn’t work. It was the stuff of horror movies. Or, it would have been if it hadn’t been broad daylight and there weren’t 15 windows around the room. More light would have made me feel better, though. 1) That is either Jesus or Satan, and I am in deep trouble either way. 2) Jesus will probably give me points for trying to make this church Powerpoint and will therefore leave me alone. 3) Satan will probably be intimidated by the effort I’m going to to make this church Powerpoint and will therefore leave me alone. 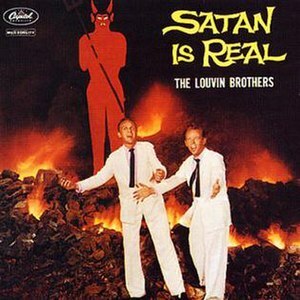 You don’t have to tell me, Louvin Brothers. Deciding it was my best option, I kept going towards the podium where the hard drive was kept, where I had to walk directly beneath the skylight. When I was under it, a person-shaped shadow passed over me. I looked up, but there was nothing there except blinding sunlight. The roof was still shaking and the sky was still rumbling. I whispered, “Jesus? Is that you?” It was something my friends and I said jokingly in high school a lot, but it was suddenly much less funny. I ran to the podium and grabbed the hard-drive, then sprinted out of the sanctuary and tried to look calm while walking to the office to see if the youth minister I worked for had been raptured (is that a verb?). She was still there, so I didn’t say anything about it. A few minutes later one of the congregants came into the office to drop something off. Thank God I’m not the only one who had the Candy Bar of Sin thought! Teehee. Candy Bar of Sin. I like it a lot and may start referring to them as such. I hope you work in a library or somewhere you have to be really quiet, because otherwise work sounds really bleak. If it looks like they’re going to fire you, let me know. I’ll start writing really serious posts about… the economy… or hangers. Or Kleenex? This was hilarious to read. Thank you! And don’t you worry, I’m making a comeback. Also, I liked your blog’s Disney World fanny pack picture. Rarely have I seen one rocked so well. I Can Haz Soshul Life?